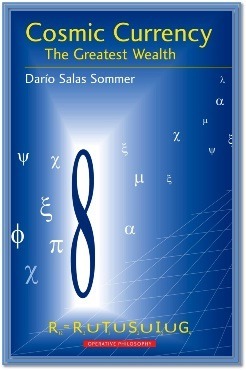 Darío Salas Sommer shows us here the path to obtaining Cosmic Currency, units of energy recognized by cosmic Nature as having universal validity for acquiring an appropriate measure of spiritual and material goods. This achievement, however, is only the logical result of the development of spiritual consciousness through which it is possible to reach human excellence, the pinnacle of potential evolution for Homo sapiens. Supporting all of this is Operative PhilosophyTM (not theoretical), which Dr. Salas Sommer has created as an instrument that allows one to raise one s existence and quality of life to the highest level through one s daily actions, harmoniously unifying spirituality, love, money, happiness and wisdom as a result. As scientific support he presents the Theory of Everything in 12 Dimensions, making ascension through different energetic planes possible and credible. The author brings together the simple and the complex, providing tools that people from all walks of life, regardless of educational and cultural level, can make use of. The application of the laws the author demonstrates permits access to a deeper reality, which is, however, interdicted for those who are convinced of the infallibility of their beliefs or the illusions of their permissive fantasies. The author warns us that this book does not invite us to irresponsibly demand anything we desire from the universe, expecting it to comply obediently with our requirements regardless of our merit or lack of it. On the contrary, what is required is profound internal seriousness, a real desire for self-improvement, a substantial dose of virtue and respect for cosmic laws.